December saw a continuation of the pick up in dollar sales over last year, while unit sales dropped slightly from last years’ level. Prices seem to be modestly increasing. Total dollar sales for December were $267,737,105 up 9% from $244,629,462 last year, and down 4% from last month at $278,084,382. Total Unit sales were off 4% at 1,281 in December from 1,337 in November, a decrease of 56. This is off by 2% and 22 from last December at 1,303. New sales were up to 206 homes this month, and 166 in November, and up by 38 from 168 last year. The low inventory level of new homes suggests a good environment for builders, and prices have begun to show a more solid uptrend. Used sales were 1,075 homes in December, off 8% from 1,171 last month, a decrease of 96, off by 60 units from 1,135 last year (Sect E p.3). ACRE numbers are slightly different from those we report. With ACRE, we released our month by month 2016 forecast which can be seen here: ACRE. 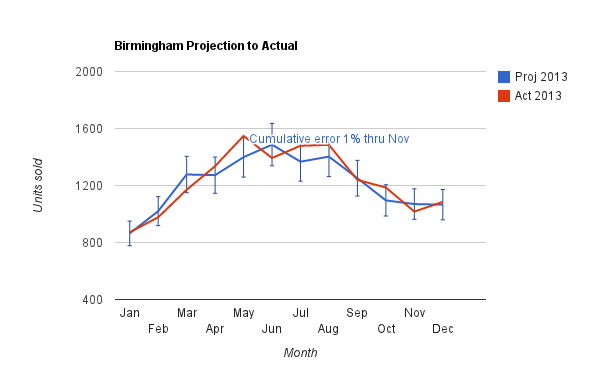 For Birmingham, the full year projection for 2016 = 13,460, a 1.25% difference from 2015 actual of 13,294. December overperformed the projection. The cumulative error is plus 9% for the year; that is actuals are ahead of projections, 14,705 through year end, an increase of 11% over 2015. The forecast for 2017 should be out in late January, once all the December numbers are recorded. Housing permits for November are a bit less than last year. For Jefferson County, in November there were 53 permits compared with 58 last year. Shelby County was somewhat lower than last year’s level as well. Total inventory is slightly lower this month at 7,926 vs. last month at 8,608 and less than 9,123 last year. (Sect C p.1). Active New listings decreased to 1,047 in December from 1,169 in November (Sect E p.3). Absorption rate for New homes is at 6 months supply this month, which is less than 7 months last year. (Sect E p.3). The New homes have normal inventory levels in the 4-8 month range depending on area and price range. (Sect C p.1). The level of inventory, both in months of inventory and housing units, has been continuing to improve for the year. Absorption for Used homes in December shows 5 months, which is less than the 6 last year. Used Active listings at 6,879 are down from last month of 7,439, and quite a bit less than 8,126 last year (Sect E p.3). Inventory levels have continued to trend down from prior years. Market performance is highly area specific, so check the individual area charts. For instance, Mountain Brook has between 1 and 4 months of inventory, 3 months overall, except in the over $900,000 category, which has 6 months of inventory (32 homes), with 9 sold in that price range last month. There are a number of MLS areas, particularly those known as the “over the mountain” communities, showing similarly low levels, including Homewood which has 3 months of inventory. Birmingham area Average Days on Market for New houses is 171 compared with last month at 209. The Used homes DOM was 119 in December vs 122 last month, (Sect A p.18). Average sales price for Sold New homes increased to $313,274 from $299,890 last month (Sect A p2), over a several month period prices seem to be increasing. Average sales price for Sold Used was $189,026 this month compared to $194,964 last month. (Sect A p2). This entry was posted in Absorption, Alabama, Annual comments, Birmingham, Building Permit, Jefferson County, Monthly comments, Shelby County and tagged Alabama Real Estate, Birmingham, Monthly comments on February 5, 2017 by Tom Brander. Dollar sales in December experienced an expected year end pick-up of 18% to $235,361,806 from November $200,218,537, almost identical to last December’s of $238,138,339 (off 1%). 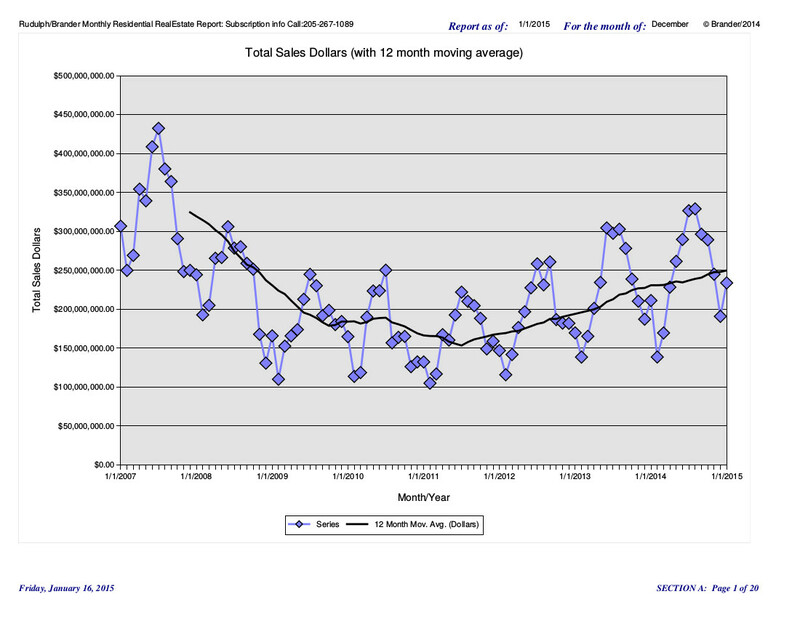 The 12 month moving average line for total dollar sales over the last three months of the year has flattened. Total Unit sales were up 20% to 1,231 in December from 1,023 in November, an increase of 208. This is up by 5% from last December at 1,172. New sales were up at 158 homes this month and 115 in November and off from 177 last year. The price pressure and low inventory levels of new homes suggests a good environment for builders. Used sales were 1,073 homes in December, up 18% from 908 last month, an increase of 165, and up by 78 units or 8% from 995 last year (Sect E p.3). ACRE numbers are slightly different from those we report. With ACRE, we released our 2015 forecast which can be seen here: ACRE. December sales were not yet available. ACRE’s year-to-date sales forecast through November projected 12,332 closed transactions while the actual sales were 12,289 units, (off by 43 units) a cumulative variance of -.35%. Given the December increase in actual sales reported here, I expect we will come in very close for the full year. Housing permits were off in Jefferson County to 58 in November from 101 in October, which is off from 72 last year. This is the lowest level since August 2014. Shelby County was 26 from 32 last month, up from 10 last year. Total inventory is slightly lower this month at 8,876 vs. last month at 9,571 and somewhat less than 9,002 last year. Active New listings decreased to 931 in December from 1,025 in November (Sect E p.3). Absorption rate for New homes is at 6 months supply this month, which is about even with 6 months last year. (Sect E p.3). The New homes for the most part have normal inventory levels in the 1-7 month range depending on area and price range. However, the $800,000-$900,000 range has 22 months of supply (11 houses) (Sect C p.1). This level of inventory, both in months of inventory and housing units has been quite stable for the year. Absorption for Used homes in December shows 6 months which is about even with 7 last year. Used Active listings at 7,945 are even with last month at 8,546 and a bit less than 8,109 last year (Sect E p.3).For the year, inventory levels have generally trended down from prior years. Market performance is highly area specific, so check the individual area charts. For instance, Mountain Brook has between 1 and 9 months of inventory except in the over $900,000 category, which has 10 months of inventory (39 homes), with none sold in that price range last month . There are a number of MLS areas showing similarly low levels of inventory, including Homewood (only 3 months of inventory). Birmingham area Average Days on Market for New houses is 205 compared with last month at 207. The Used homes DOM was 125 in December vs 121 last month, (Sect A p.18). Average sales price for Sold New homes decreased to $310,211 from $333,656 last month (Sect A p2). Average sales price for Sold Used homes decreased to $173,670 from $178,247 last month (Sect A p2). The moving average price for all homes has been up steadily for the past year. (Sect A p2). This entry was posted in Absorption, Alabama Center for Real Estate, Annual comments, Birmingham, Building Permit, Jefferson County, MLS, Monthly comments, sales forecast, sales projections, Shelby County and tagged Absorption, Birmingham Alabama, Housing Statistics, Jefferson County, Monthly comments, Residential Real Estate, Shelby County on January 22, 2016 by Tom Brander. 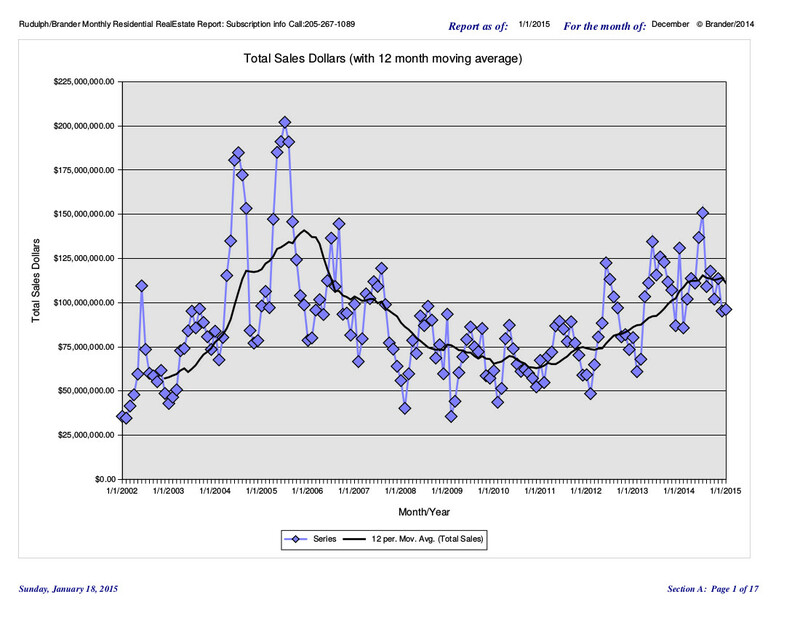 Sales dollars increased more than expected; 33% in December to $122,750,797 from November $92,442,408. This is 24% above December last year at $99,245,507. (Sect A p.2). There was also an expected increase in last month late reported sales, making every month this year better than last year’s healthy levels.The 12 month moving average line of sales, which had continued to point up steadily for three years, has now gotten a healthy upwards tilt. Lack of new construction now seems to be depressing sales somewhat. Inventories are trending down. Sales in most price categories show consistent improvement. Inventories are improving, but remain high at over a year for anything over $500,000. This month the $400,000-$500,000 inventory dipped to 9 months. In concert with ACRE, The Alabama Center for Real Estate, we have projected expectations for 2015. We use the ACRE provided data for the projections, which differs slightly from the data in this report. The projection for 2015 located here expected a unit increase of 17% over 2014 actual. Through November cumulative sales are running 8% ahead of the projection. As of the moment December is not yet available. On a unit basis, sales of all houses were up 22% at 479 this month vs. last month at 394, which is 22% better than last year’s healthy level of 466. Used Home sales decreased 17% to 414 this month vs. 351 last month, which is up 3% from last year’s 399 (Sect A p.18). New Home sales were 65 this month vs 43 last month and compared with 66 last year. New listings for New homes decreased to 99 from 134 in November. Used homes New listings decreased to 366 from 527 in November with net inventory down. The absolute number of Used Active homes on the market, which had a slight peak mid-summer of ‘09, has been consistently improving. In December, there were 2,956 Active Used homes, a reduction from 3,657 in November and a new multi year low level. New homes, which peaked in December 2006 at 2,144 Active, now sits at 486. The Absorption rate for New homes was 7 months of inventory in December vs. 9 in November. The Absorption rate for Used homes was 7 months of inventory in December vs. 8 in November. Over the last four years the drop in months of inventory for Used homes has been steady and impressive from 25 months plus in November 2008 to 7 months this December. The inventory of homes in the upper price range remains high with homes over $500,000 at over a year’s supply, but even here we are seeing improvement. I would expect construction to begin to pick-up in the under $400,000 range, but so far have not seen it. Average sales price for all homes has been improving modestly for the past year. For New units, prices increased to $241,463 from $227,591 last month. (Sect A p.14). Average Used home prices increased to $258,589 from $235,487 in November. The price trend is up for the year. Average Days On Market for New Sold properties in December was 161 vs last month of 170. Days On Market for Used was 160 compared to last month 149. This entry was posted in Absorption, Alabama Coast, Annual comments, Baldwin, Forecast, Home values, Inventory, MLS, Monthly comments, sales forecast, sales projections and tagged Alabama Coast, Baldwin County, Monthly comments, Residential Real Estate on January 22, 2016 by Tom Brander. Sales dollars increased 1% in December to $96,165,774 from November of $95,270,573. This is down 26% from December last year at $130,825,801. There was a very big spike in year end condo closings last year. (Sect A p.2). The 12 month moving average line of sales which had continued to point up steadily for three years can now best be described as “squiggly.” I would characterize the market activity as “unusual”. The lack of new construction now seems to be depressing sales somewhat. Inventories continue trending down. In concert with ACRE, The Alabama Center for Real Estate, we did projections for 2014 full year sales. We use the ACRE provided data for the projections, which differs slightly from the data in this report. We project unit sales for Baldwin County increasing by 32% over 2013 and the projected condo increase of 8% over 2013. As of November, the cumulative year over year change in units is up 5%, far short of the adjusted forecast. The condo actuals are cumulatively at about 8% below the forecast, with a 2% year to year change. On a unit basis, sales of all houses were up 5% to 449 this month vs. last month at 426, which is off 3% from last year’s 461. There is still substantial inventory available to satisfy demand. Used Home sales increased 6% to 388 this month vs. 366 last month, which is up from last year’s 347 (Sect A p.18). New Home sales were 60 this month vs 60 last month and compared with 114 last year. New listings for New homes decreased to 61 from 79 in November. Used homes New listings decreased to 420 from 568 in November with net inventory down. The absolute number of Used Active homes on the market, which had a slight peak mid-summer of ‘09, has once again been improving. In December, there were 3,249 Active Used homes, a reduction from 3,962 in November. The New home market, which peaked in December 2006 at 2,144 Active, now sits at 437. The Absorption rate for New homes was 8 months of inventory in December vs. 9 in November. The Absorption rate for Used homes was 8 months of inventory for December vs. 10 in November. Over the last four years the drop in months of inventory for Used homes has been steady and impressive from 25 months plus in November 2008 to 8 months this December. The inventory of homes in the upper price range remains high with homes over $400,000 at over a year’s supply. Even here we are seeing improvement, which may set the stage for some acceleration in new construction. Average sales price for all homes has been improving modestly for the past year. For New units, prices decreased to $238,807 from $271,144 last month. (Sect A p.14). Average Used home prices decreased to $210,333 from $215,852 in November. The price trend is up for the year. Average Days On Market for New Sold properties in December was 164. Days On Market for Used was 155. This entry was posted in Absorption, ACRE, Alabama Coast, Annual comments, Baldwin, Forecast, Home values, Inventory, sales forecast, sales projections and tagged Alabama Coast, Baldwin County, Days on market, Housing Statistics, Monthly comments on February 1, 2015 by Tom Brander. Dollar sales in December improved by a better than expected 11% to $206,142,852 from November’s $186,359,182, up by 21% from last December’s $169,625,116. The 12 month moving average line for total dollar sales continues to move up indicating continued improving market conditions. Note: The 19% increase in dollar sales vs 9% increase in unit sales is mostly due to higher priced properties picking up in activity. Unit sales were up 7% to 1,085 in December from 1,017 in November, a increase of 68. This is up 11% from December 2012 at 974.This number will increase as late sales are reported. Our ABRE/ACRE Projections for 2013 are 1,065 sales for December. For December, actual sales for the month were 2% worse than projections and 1% higher than year to date. Please see here for a summary of the projections http://goo.gl/nytW8 and the spreadsheet with details and month by month projections http://goo.gl/GEYWa (see the tabs on the bottom). New sales increased by 15 units to 136 homes this month from 121 in November and are about even with 135 last year. Used sales improved 6% to 949 homes in December from 896 last month, a decrease of 53, and up by 110 units from 839 last year(Sect E p.3). This month total inventory is 8% lower at 8,581 vs. last month at 9,870 and 9,224 last year. The drop in the current month is caused by month-end expirations which will come back on the market. We are seeing a seasonal downtick in inventory and which is slightly lower than prior years, although New home inventories are beginning to look a bit high. Active New listings decreased to 784 in December from 1,069 in November, a decline of 285 units (Sect E p.3). Housing permits were down in Jefferson County to 53 in November ( the lowest level in quite some time) from 122 in October. Shelby County went from 28 to 24 in November. Absorption for Used homes in December shows 7 months,one month better than 8 months last year. Used Active listings at 7,797 are lower than the 8,404 last year (Sect E p.3). The market performance is highly area specific, so check the individual area charts. For instance, Mountain Brook has about three months of inventory except in the over $900,000 category, which has 7 months of inventory (26 homes) with nine sold in that price range last month . The average days on market for that category is 157. Birmingham area Average Days on Market for New houses is 213, same as last month. The Used homes DOM was 135 in December, same as last month (Sect A p.18). Average sales price for Sold New homes increased to $281,589 from $274,239 last month (Sect A p2). Average sales price for Sold Used homes increased to $176,867 from $170,956 last month (Sect A p2). The moving average price for all Homes has been up steadily for the last year. (Sect A p2). This entry was posted in Absorption, ACRE, Alabama Center for Real Estate, Annual comments, Birmingham, Building Permit, Forecast, Inventory, Jefferson County, Monthly comments, sales forecast, sales projections and tagged Absorption, Birmingham Alabama, building permits, Days on market, Housing Statistics, Monthly comments, Residential Real Estate, Shelby County on January 15, 2014 by Tom Brander. Last year, ABRE Analytics, a collaborative research partnership consisting of the Alabama Center for Real Estate (ACRE) and Tom Brander, began studying the correlation between unemployment rates and future real estate sales projections in selected markets across the State of Alabama. View full sizeABRE Analytics: 2013 residential sales projections for selected real estate markets. All rights reserved. With the release of the metro unemployment data for January 2013, ABRE Analytics is pleased to present our 2nd annual forecast stemming from this methodology and related commentary. The above table summarizes last year’s results and our expectations for 2013. These predictions assume no “major events”. As expected with any new trends model in its inaugural trial run, the 2012 predictions were mixed. Alabama residential saleswere up 5.9 percent in 2012. In Huntsville, the forecast was within 2% of the full year 2012 results. In the aggregate, the results pointed in the right direction right, but with some error so this led the team to explore some alternative approaches for this year’s predictions to improve accuracy. In the markets with the greatest error we revised our methods to use the last quarter of 2012 sales via straight line linear regression instead of the unemployment rate. This method appears to be more accurate in most markets historically and hopefully going forward. With these adjustments, above is the overview of what ABRE Analytics think might happen in 2013. As for the projection of a 12% increase for Tuscaloosa that is out of line with the other markets, ABRE’s opinion is that this may be a little too optimistic, but we have yet to figure out a consistent method to arrive at a better projection for Tuscaloosa in 2013. Of course, the local market’s near-term response to the tornado of April 27, 2011 certainly has a role with the difficulty in identifying a projection that could be presented with more confidence. Last year we experienced a similar issue with Montgomery, which prompted us to develop the alternative methodology of using last quarter sales for predictions. The method ABRE used for 2012 was based entirely on the January unemployment rate for a market area. The assumption was that the January unemployment rate eliminated the effect of holiday temporary work and would reflect the mood of the populace towards buying and selling a new home in the upcoming year. A standard linear regression line yielded a better than 80% correlation since 2004 in all areas. The standard error however is somewhat high. This method also has the benefit of using two longer term trends, unemployment and home sales, and only at a single point per year, which eliminates a lot of “noise” in both series. The seasonal regularity of sales is such that if you know the total sales for a year, dividing the total by the average proportion of the yearly sales attributable to a month has shown to be remarkably stable. Exceptions to the regularity do occur, such as fiscal cliff drama and the tax credit for first time home buyers in 2009. ABRE eliminates this data when calculating the monthly spreads. ABRE originally chose unemployment data as it is one of the more timely pieces of data released by the government, as well as being released by geographies that generally correspond to the reported real estate market areas. 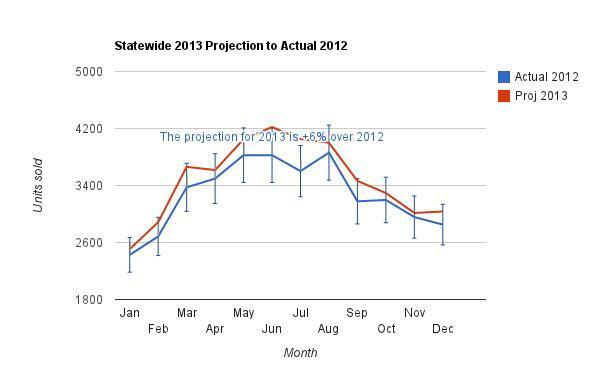 Other data from various government agencies are released so late as to not be timely enough for meaningful projections. So, what ABRE presents is our best estimate of next year’s sales which specifically excludes the possible impact of unpredictable governmental action or inaction, although even this seems to be having less impact as both the populace and markets begin to ignore political histrionics. For what it is worth, ABRE did test everyone’s favorite housing predictor, interest rates, and could not find any useful correlation. In each case ABRE experiments with prior years data to see how well the prediction methodology would have worked. We tried using the last quarter sales of the prior year to “regress” against the full year sales of the projected (next) year. This is based on the same premise that recent data may be indicative of future results. In each case, except Huntsville and Tuscaloosa, this methodology (last quarter of the year to the following year) resulted in greater historical accuracy in predicting and considerably better correlation numbers. We did exclude 2010 from the analysis since the last quarter of 2009 had abnormally low sales, (although the full year sales were as expected), due to the 1st time homeowners tax credit that pulled sales into earlier quarters and depressed the year end. Complete spreadsheets with all data are available as public Google spreadsheets, which also include month by month projections, at http://goo.gl/jtJGW. ABRE presents these projections as a “work in progress” and as a tool for assessing how well current sales are performing against some level of “informed” expectation. You should not rely on them, but nonetheless ABRE hopes the projections are found useful. ABRE welcomes comments and suggestions for improvement. About ABRE Analytics: Strategic collaboration is one of the keys to accelerating the flow of insights in the 21st century. The Alabama Center for Real Estate (ACRE) and Tom Brander has been successfully collaborating since 2009. The flow of ideas stemming from this relationship have led to solutions to better serve the Alabama real estate industry and consumers. ABRE (ACRE/Brander Real Estate) Analytics is designed to foster future creative thinking while also providing hands-on experience for student interns of ACRE. About ACRE: ACRE’s core purpose is to advance the profession of real estate in Alabama by providing relevant resources in the areas of research, education and outreach. The Center, founded in 1996 by the Alabama Association of REALTORS, the Alabama Real Estate Commission and the Office of the Dean at UA’SCulverhouse College of Commerce, also acts as an industry liaison for the benefit of business school students pursuing a career in real estate. To learn more, please visit ourwebsite. About Tom Brander: Tom Brander is a prominent real estate publisher. He produces The Rudulph/Brander Monthly Real Estate Report in the Birmingham, Huntsville and Baldwin County markets. His company, OSWCO, LLC (Open Software Company) is an authorized Google reseller. He has earned the Google apps sales consultant certification and the Google apps deployment certification, from Google. Tom also co-produces the ACRE quarterly Real Estate Sentiment Index and report in conjunction with ACRE. He is a designated ACRE Education Instructor and serves as a member of the ACRE Board of Trustees. To learn more, please visit http://oswco.com. This entry was posted in Absorption, ACRE, Alabama Center for Real Estate, Annual comments, Auburn, Birmingham, Forecast, Home values, Huntsville, Jefferson County, Montgomery, North Alabama, sales forecast, sales projections, Shelby County, Tuscaloosa and tagged ACRE, Alabama, Alabama Center for Real Estate, Huntsville, Montgomery, Prediction, real estate on March 10, 2013 by Tom Brander.